I’ve never been one to over-decorate my home for Christmas. Instead, I prefer setting out things with sentimental value. Last year, I realized my Christmas Tree Skirt lacked both sentiment and style. 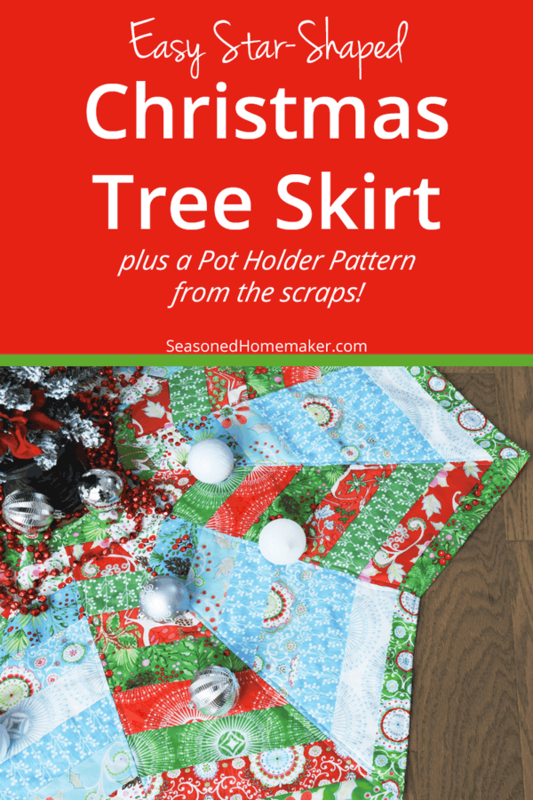 Instead of a beautiful, festive skirt that wrapped around my tree, I had a serged piece of black fabric. We’re talking seriously ugly and completely lacking in holiday cheer. While I could easily run over to Target and purchase something that would be beautiful, I wanted a Christmas Tree Skirt that could be cherished by my family. 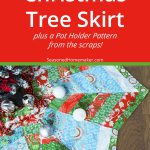 I needed a simple Christmas Tree Skirt Pattern that I could sew quickly. It should have a little quilting, but not too much. The pattern and supplies must be economical. We’re talking no more than a weekend project. One thing that makes the pattern fast is the lack of cutting. Instead, the pattern calls for a bundle of pre-cut strips. After looking through some of the tree skirts that other class members had created, I went with a scrappy look. I made one simple change. 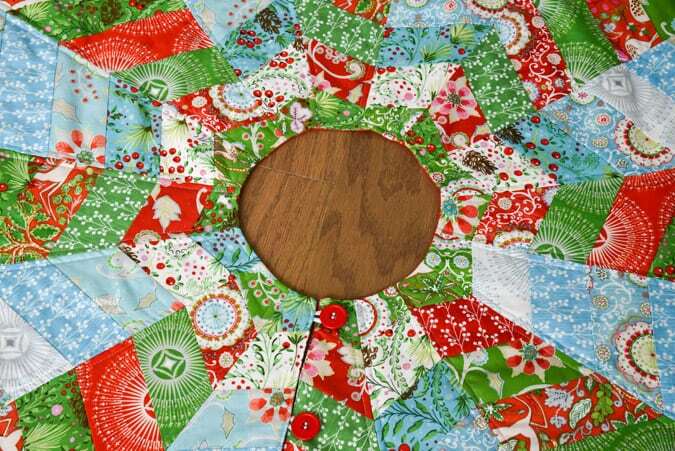 The center of the tree skirt mimics the star-shaped outside edge. Because of the shape of our tree, I decided to make my center circular-ish. Because it’s under the tree, it will never be noticed, anyway. The pattern uses simple elastic button closures so no buttonholes! It can also be reversible. Just add a set of buttons to the back and you’ll be good to go. 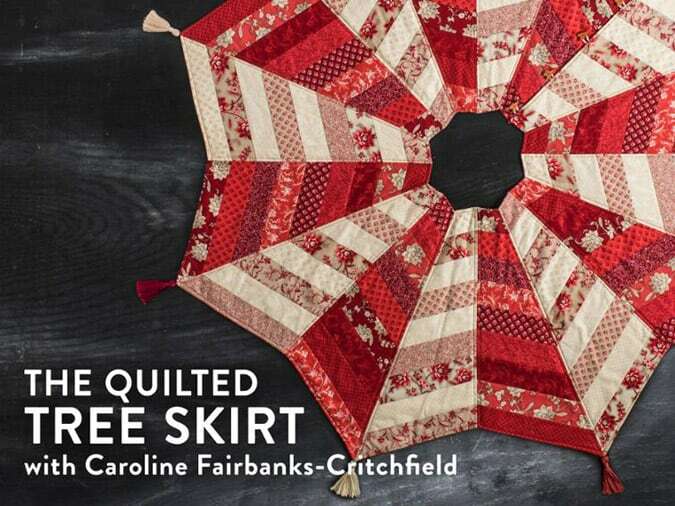 What sets this pattern apart is its clever use of the stitch and flip Quilt As You Go method (Caroline refers to it as “foundation piecing”). To better understand, watch this short video that demonstrates how to stitch and flip. I give this class my highest recommendation because it’s simple, economical, and quick. Sometimes it’s difficult to find Christmas fabrics, especially the closer you get to the holidays. 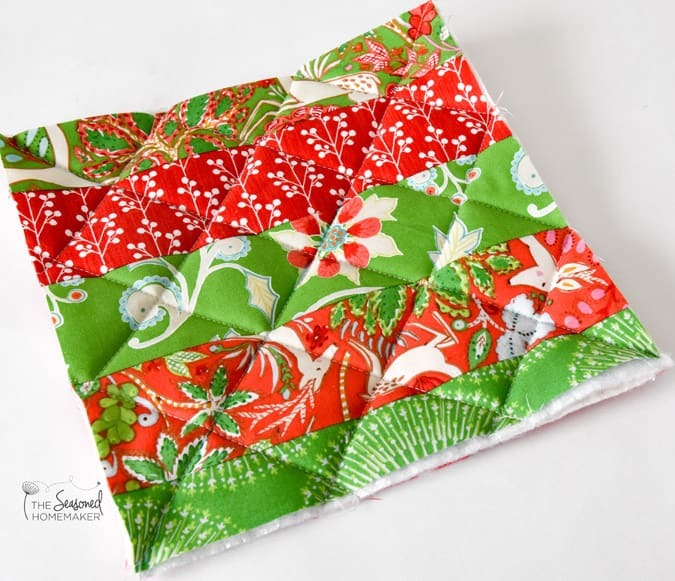 Check out Fat Quarter Shop’s Christmas Fabric Store. 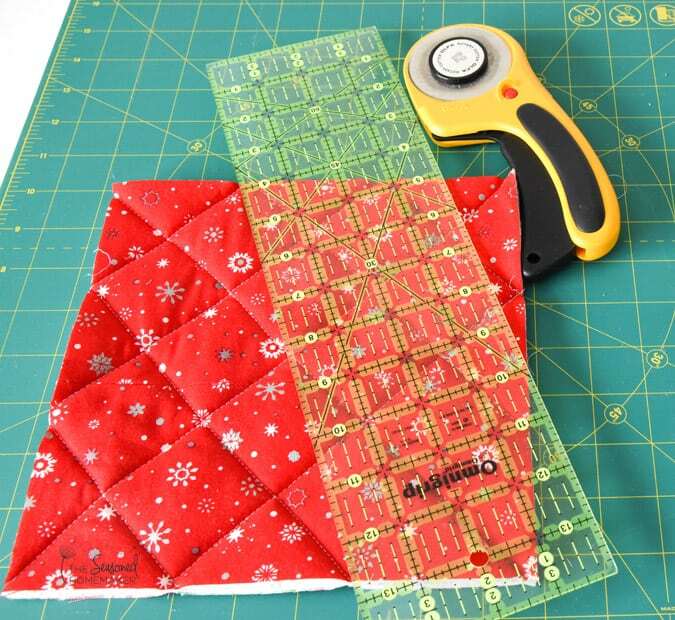 (affiliate) They always have a great variety of Christmas jelly rolls which are recommended for this project. 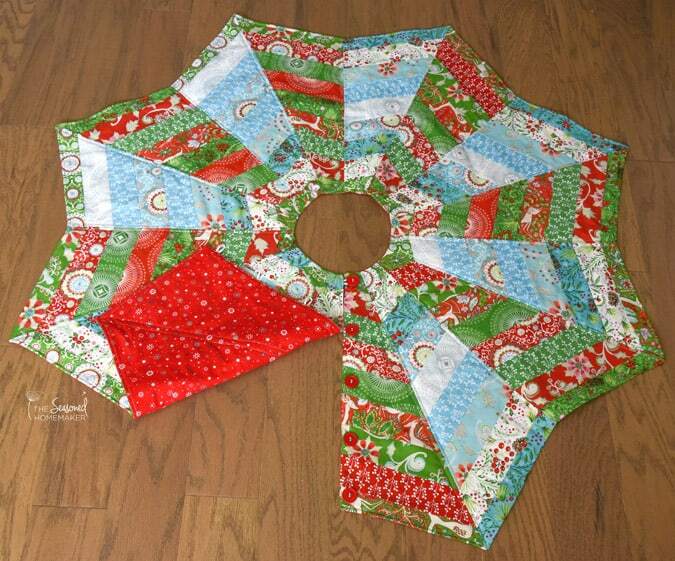 I had a little fabric left over from my tree skirt project and decided to make a few potholders from the scraps. 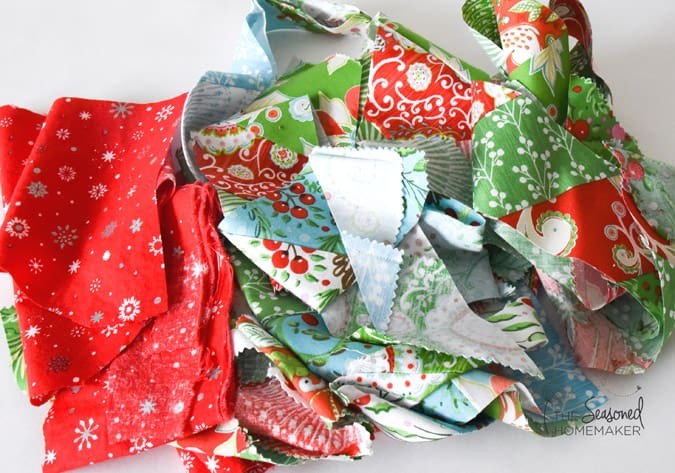 When creating the tree skirt, the instructions call for the strips to be sewn together in sets of nine. From there you take the blade template and cut out the individual sections. This leaves a little bit at the end of each strip set and that is enough to cut out four potholders. 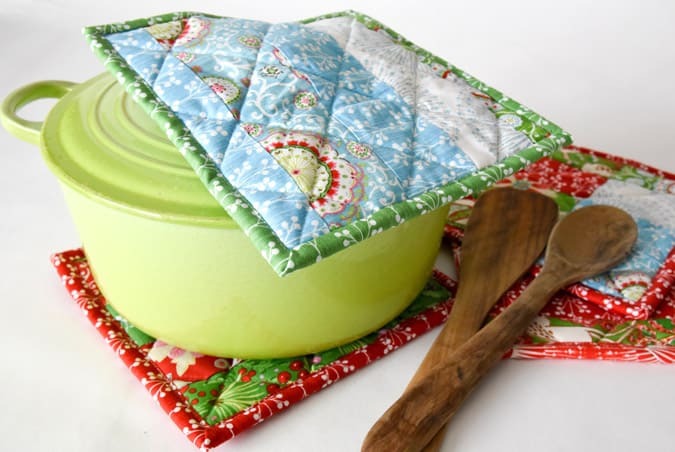 For the back of the potholder, use leftover fabric from my tree skirt backing. From my pre-cut strip bundle I still had four additional 2.5″ strips. These are the perfect size and length for binding the potholders. Two pieces 9″ x 9″ from the remains of the strip piecing. Two pieces of 9″ x 9″ Quilt Batting. Add layers in this manner. 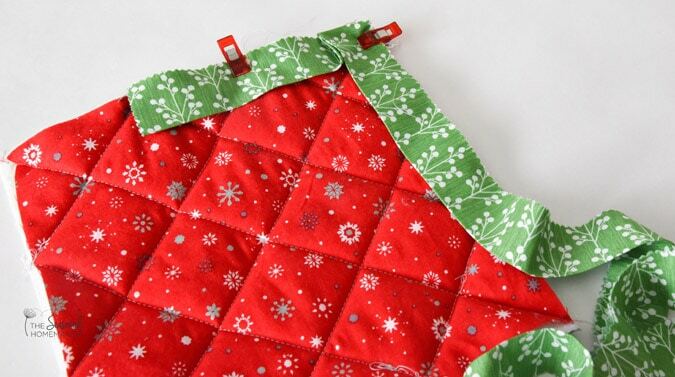 Optional Step: If your fabric has a simple design, you might want to add a few Christmas Appliques to jazz them up! Use a walking foot to stitch diagonally. I set mine to 2″ apart. Fold the 2.5″ strip wrong sides together and press. Attach to the back of the potholder using a 1/4″ stitch allowance. Turn the binding to the front and stitch down. 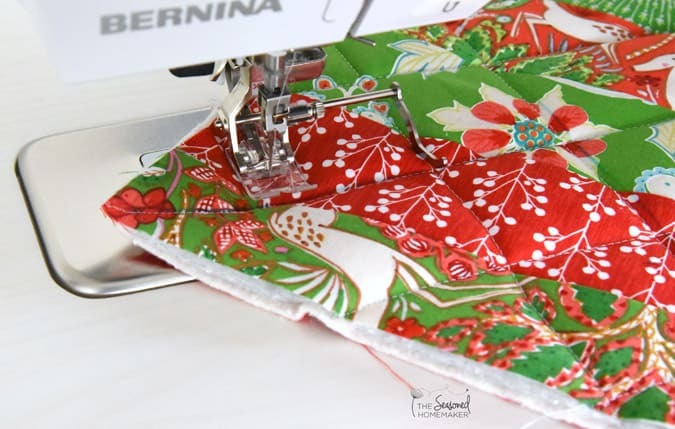 Optional: To keep my binding from shifting when I stitch it down on the front I add pieces of 1/4″ Steam A Seam*(*affiliate) near the folded edge and press. Nothing moves! I was able to make four potholders from my scraps. It took me about two hours from start to finish. Won’t these be wonderful at Christmas? My favorite part was being able to use up most of my scraps. After making a Christmas Tree Skirt and four pot holders this is all that was left. I love, love, love simple projects like these two. And being able to use most of my scraps was the cherry on top! I have that class and made a beautiful skirt! Now to search for those scraps to make some pot holders. Thank you. 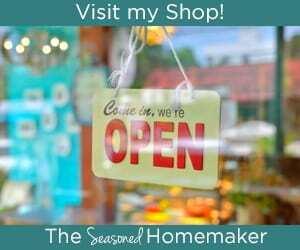 Now that I have finished baking and sewing for my open house last Saturday, I am ready to make something for myself – this is it! Thanks for the idea – I hope I can follow the instructions on how to get the pattern. I don’t seem to be having much luck with the video. Maybe I have to pay first? I love that pattern too. And I particularly love the idea of 4 new potholders! I looked at my two favourite, but very tired old ones only yesterday, and realised they need replacement, so illl kill two birds with one stone. Thank you yet again Leslie! You could still make coasters for glassware out of the fabric scraps and use even more of it. 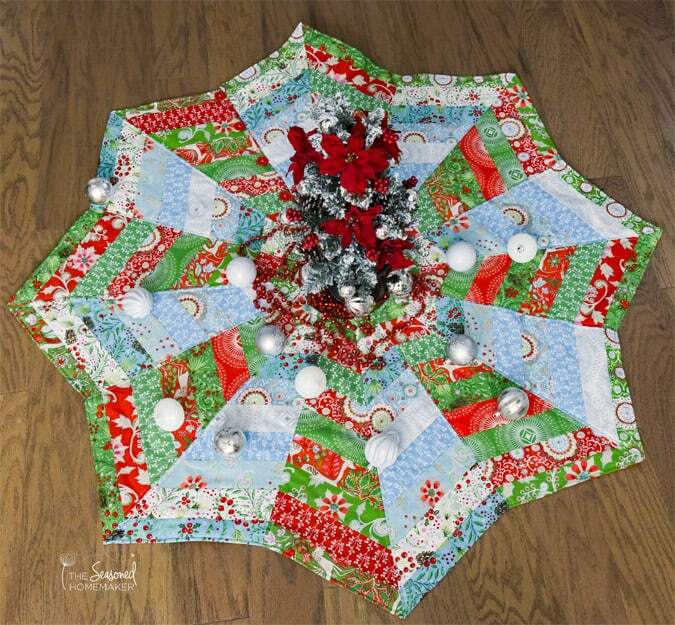 Lovely tree skirt! I looked at Caroline’s pattern last year, but I didn’t have enough time. (You were right!) 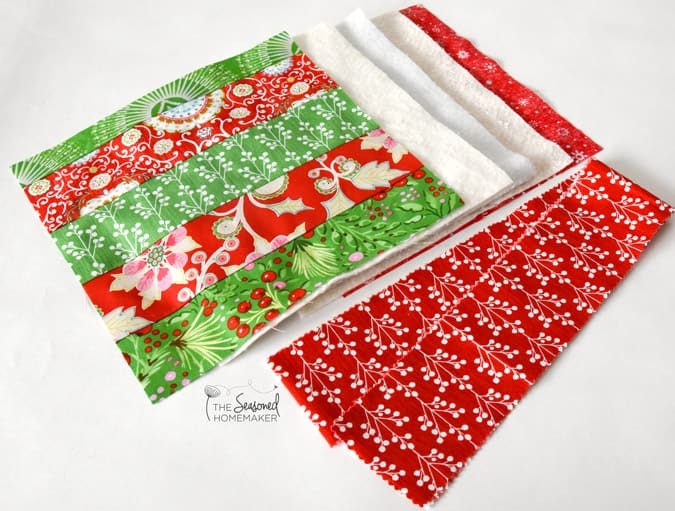 Does the tree skirt take most of the jelly roll? I believe the skirt is about 50″ in diameter. You can check Craftsy for exact measurements. What a beautiful skirt! I’m not a quilter but several years back I made a huge (to fit an 8 foot tree) skirt of rose moire taffeta for under my Victorian themed tree. After the pie pieces were sewn together I quilted it with a stippling pattern (because I’m not a quilter, maybe someday after I retire) using gold thread and finished the edge with a rose and gold rope. I’ve now donated the tree to the agency that I work for and a lot of people have the opportunity to enjoy it’s beauty.